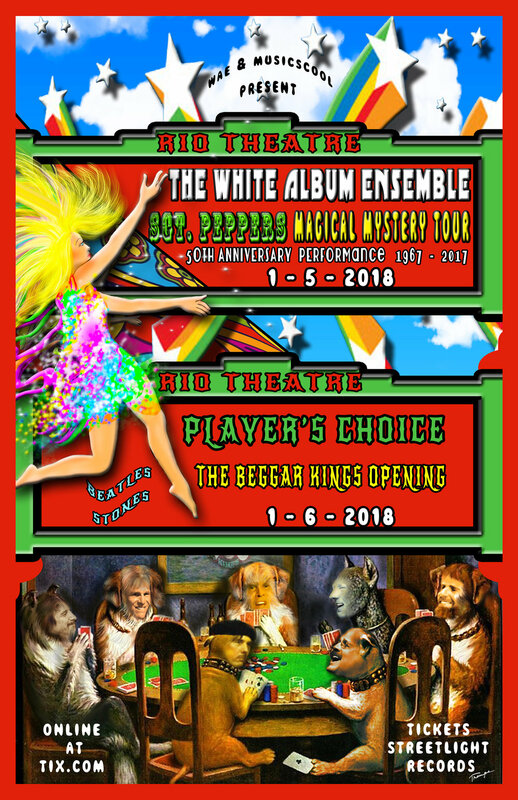 Jan 5 will be the make up date for Dec 29ths 50 yr celebration of Magical Mystery Tour, and Sgt Peppers. A Flu knocked out all 5 singers, who can now recuperate and b ready to rock at their best. The WAE will be enhanced by members of SF, Santa Cruz, and Oakland symphonies, in string Quartet, and Horn quartet, capturing the orchestration of the complex, very arrange songs. The Beatles never did it live, nor has anyone else, with this level of detail and quality. Renowned percussionist Jim Greiner is also featured.